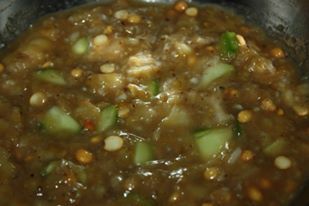 add tamarind paste,powdered jaggery, fried dal,mango pieces, grated coconut,neem flowers,ghee,honey. In accordance with Ayurveda it is stated that Ugadi pachadi cleans away the vata, pita, kapha doshalu from one’s body. Ugadi pachadi is a balanced pachadi because it includes nutritional value that purify the system and serves as prophylactics (protection against illness or disease). Food made from neem flower are very well recognized for their flavor in addition to medical use. The neem tree flowers blossom while in the months of April and May. These flowers are a storage facility of anti-oxidants. Neem flowers have specific medical qualities that aren't seen in neem leaves. 2 Replies to "UGADHI PACHADI"
Om Sai Ram. Thanks a ton for sharing this. Had always been wanting to know how Ugadi Pachadi is made. Thanks a lot. Sairam. Om Sri Sairam, it’s Swami’s grace and blessings that we’ve been given this recipe. I’m taking up as stated for 9 days. Loving Sairam.